When you see an advertisement that offers you to upgrade your FLV player or Java plug-in think twice before clicking, because you might end up installing such adware application as Savenet. Once the application is installed on your computer, the next time you access online shopping websites you will be displayed Savenet Ads that are supposed to “compare between available deals and promotions with the new save on browser add-on”. Although the application should allow you purchase goods at an optimal price, we strongly advise you to remove Savenet Ads right now. Savenet Ads are highly unreliable and might even lead to certain computer security problems, because adware is susceptible to third party exploitations, and clicking on a corrupted pop-up may redirected you to a suspicious website. Most of the time adware is used to redirect users to websites that allow adware creators to generate financial revenue by increasing site traffic. However, we cannot rule out the possibility that constant redirections might lead to malware infection as well. Therefore, the sooner you remove Savenet Ads from your computer the better. The main homepage for this application is located at saveneto.info, but users seldom download the program there. It is a lot more often that Savenet Ads arrive bundled with freeware and adware applications that are downloaded from third party file hosting pages or via flash pop-ups. Based on our research, Savenet Ads are mostly bundled with websearch.amazingsearches.info browser hijacker and YouTubeAdblocker adware application. The common feature between YoutubeAdblocker and Savenet Ads is that both applications may have their names randomized on the list of installed programs. For example, Savenet may be installed as save net, saVE Net, savee nett and so on. However, all of these names refer to Savenet Ads and you can be sure that sooner or later your browser will be slowed down by the constant influx of pop-up ads. Savenet Ads make use of ams1.ib.adnxs.com adware sever to generate the content for the pop-ups, but no one can guarantee that the content displayed on the ads is 100% safe. Hence, it is for the best to terminate Savenet Ads right now to protect your system and yourself from malevolent exploitation. To remove Savenet Ads open Control Panel and remove Save Net application manually. The add-on will disappear automatically from Internet Explorer only. As far as Mozilla Firefox and Google Chrome are concerned, you will need to remove the add-on via browser settings manually. However, that is not challenging and you can do it by following the instructions below. After manual removal run a full system scan with a licensed antimalware tool to ensure that all of the dangerous files and programs have been removed for good. Invest in an antispyware application that would secure your system against similar intrusions. Highlight Savenet and click Uninstall. Select Uninstall a program and remove Savenet. Access Add or remove programs and uninstall Savenet. 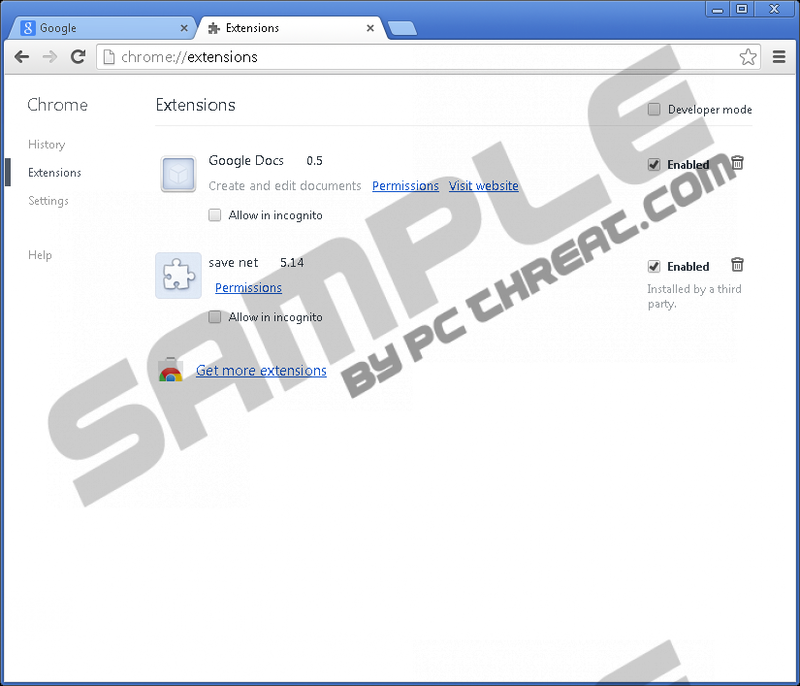 Click Extensions and disable Savenet. 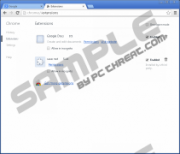 Remove Savenet from the extensions list and restart your browser. Click Extensions and remove Savenet from the list. Quick & tested solution for Savenet Ads removal.